There are no dead cultures. There’s an idea that has been bothering me a lot lately when I make my rare forays into the Neopagan blogosphere, and that’s the idea that supposedly dead cultures are up for grabs for everyone to take just because they’re considered dead. Egyptian and Greek being a common example, but there’s also Aztec and other indigenous ways that have been considered dead since the Europeans invaded the Americas. Even European religions are considered dead despite having records of up to 50 years ago in some cases. For starters, cultures are created by people. They cannot truly die if the people are still alive, and in all the cases I’ve seen so far, they are most definitely still alive. There’s still Aztec, Mayan, and Egyptian people around who are the descendants of those who practiced the old religions. Hell, there’s even Taino people still, despite US history classes’ insistence that Columbus wiped them all out. Even if the Egyptians are mostly Muslim, that doesn’t mean their ancestor’s ways aren’t still a part of them and their current culture’s manifestations, or that they don’t have pride and ownership of their ancestor’s culture. That connection and that ownership should be respected. Furthermore, even if a culture actually is dead, that still doesn’t mean everyone else can have at it. Do you rob graves to take the dead’s jewels and clothes? Hopefully not, that would just be plain disrespectful and gross. Dead cultures, and the people who used to live them, deserve respect too. There are ways to incorporate various symbols and ideas into a syncretic religion, but putting Bast, Thor, and Baron Samedi onto an altar with a smudge stick, a dreamcatcher, a pentacle, and Buddhist prayer beads and chanting from the Tibetan Book of the Dead ain’t it. That’s just making a fetishistic collection of exotic-looking items to fill a spiritual void in your life. Cultures are not a free-for-all, dead or alive. Cultures are not meant to be “shared” by random people all over the world. That is a lie perpetuated by Western colonialism to turn exotic cultures (and the people within them) into commodities to own and exploit. Taking exotic sacred items and ideas and reducing them into something else is not true sharing. Thinking that a god from a foreign culture “called” you is not an excuse. At the VERY least, if you’re that insistent upon worshiping a god or using an idea from a foreign and/or “dead” culture, put some effort into understanding the context of the culture(s) and the various reasons for why the god or the idea is what it is. Don’t just collect things for your personal benefit, actually learn all that you can learn about them. Put effort into showing respect for the culture(s) you’re taking from. The only information that I have of this being in an Old Magyar context is the name. Hold means moon, Anya means lady. Even then, it’s questionable whether this is just a name (like how contemporary English speakers say “Man in the Moon” while just considering the moon a rock in space), or if this was an actual deity with a personality and a story. Contemporary Hungarian culture has more beliefs and ideas fleshing out the moon, but the modern agrarian society is rather different than the primarily steppe riding society of 1000 years ago (and who knows what the Hungarians were before that, the scholars who devoted their entire career to this still haven’t figured it out since there’s several theories at the moment). Therefore the values and social needs are different, and we see that many folk beliefs center on the moon cycle being a calender that was most often used to time crop and herding practices. Interestingly enough, “hold” also referred to an area of land (whether it was a unit of land measurement, or was a parcel of land, I cannot tell). There’s also folk beliefs that recognize the cyclical nature of the moon being similar to menstrual cycles, like many other societies have. Folktales that describe the world tree upon which the taltos climb show the sun and moon being cosmological entities residing in the upper branches of the tree, with no personalities or sense of being attributed to them. There are several depictions of the Sun riding around (i.e. Napkirály in a chariot or on a horse), or being driven around (i.e. a Hungarian Christmas ballad with the Sun being in Csodaszarvas’s antlers) in folktales, but none for the moon that I’ve found thus far. There’s several possibilities that we can take away from this. For one, maybe the moon just wasn’t an important entity in the deep past, but became important more once the Hungarians became an agrarian society (Other agrarian societies have also used the moon cycles as a calendar for crop activities; in Hungary it is the new moon that marks a new month, in some Germanic cultures it is similar with the first visible waxing crescent marking the new month). The other is that I simply haven’t found the information yet, or that the information is lost to time. Either way, considering Hold Anya as a distinct deity rather than a force of nature is, as far as I can currently tell, not historically attested and is therefore UPG. My personal view is that Hold Anya could be a deity, but an impersonal one. To be honest the only “deity” attribute I regard her with is to list her as a moon deity (in terms of gendering the moon, while I feel that it’s mostly unnecessary I also feel that the moon shifts between male and female, story-wise). Otherwise my perspective is more along the line of modern Hungarian folk culture. 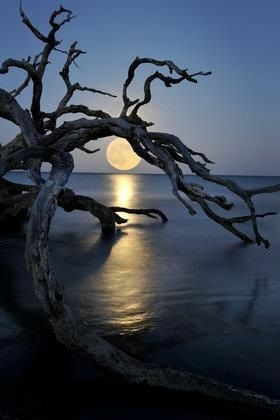 I refer to the literal moon that is seen in the sky, and consider it a force of nature that creates a useful calender and affects the earth’s waters. The Germanic perspective that I also include in my “religion” is similar, where Manu (in this case, a male name) is impersonal and doesn’t have a whole lot to him other than existing and being listed as a deity. I usually just call the moon “Moon” and don’t engage in devotional rituals or create dedicated holy days. The Moon is just there, always watching and always with us. The eternal sea’s waves are waving, and rolling. How shall we create such a world, my dear father? sleeping eyes , sleeping seeds, the sleeping Magya’s. 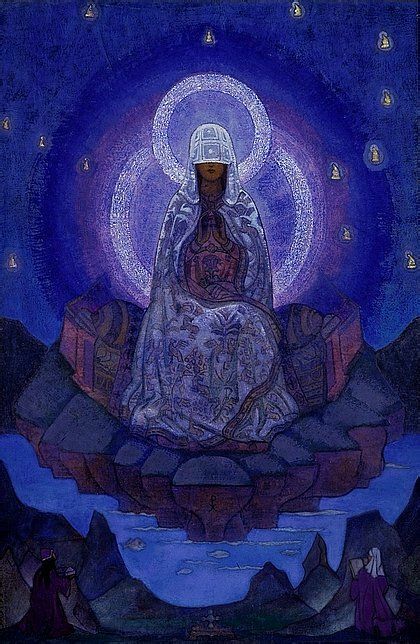 Mother Danube is a deity of two-fold importance to me, both relating to ancestry in some way. On one hand, she is the “eternal” sea, the primordial waters from which the land and all living things were brought out of. 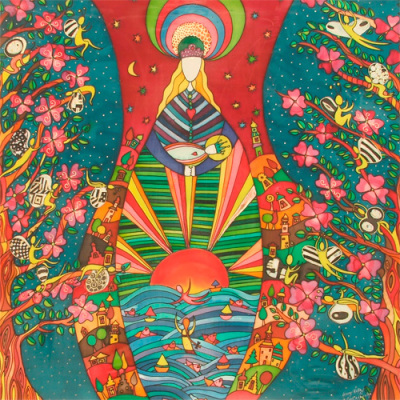 Everything on earth came from her (she’s basically step 2 of creation; step 1 was making the whole universe out of Hajnal Anyácska). 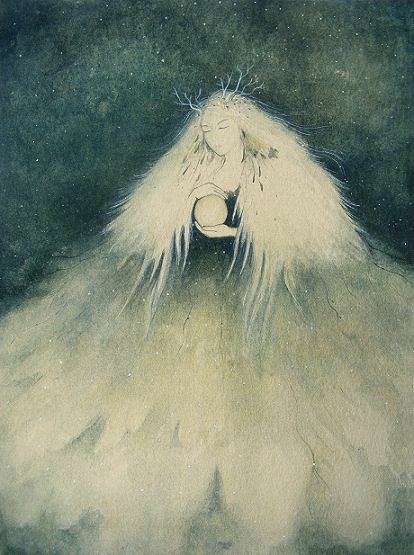 The Sun King, Napkiraly, had to transform into the first bird and dive into her to bring the seeds of life up from the depths, along with some muck to make dry land from. She now exists surrounding the world that we know. On the other hand, the river Danube literally goes through the regions in Austria and Hungary that I have known ancestors from. She is literally the water source of my ancestors, whether for drinking, fishing, travel, or whatever. That is why I named the blog after her, her waters are a symbolic link between me and the heritage I seek to make traditions from. However, unlike how Celtic-leaning circles refer to the deity, I find Mother Danube the deity to be impersonal, and primarily outside our world. 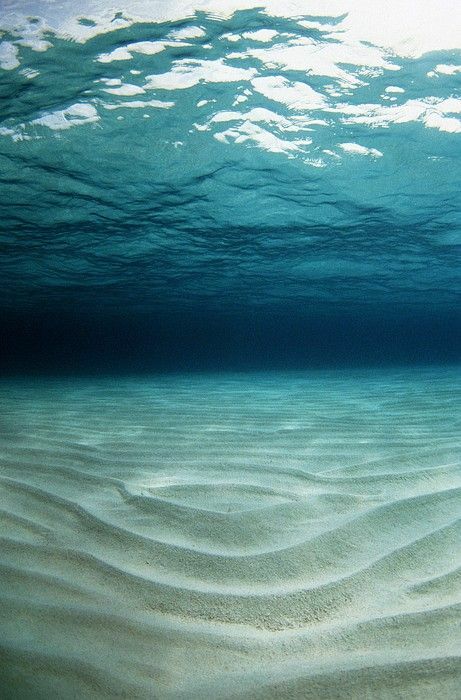 As the Eternal sea our world floats inside her and is surrounded by her, but she’s still outside the Upper/Middle/Under world cosmological concept. 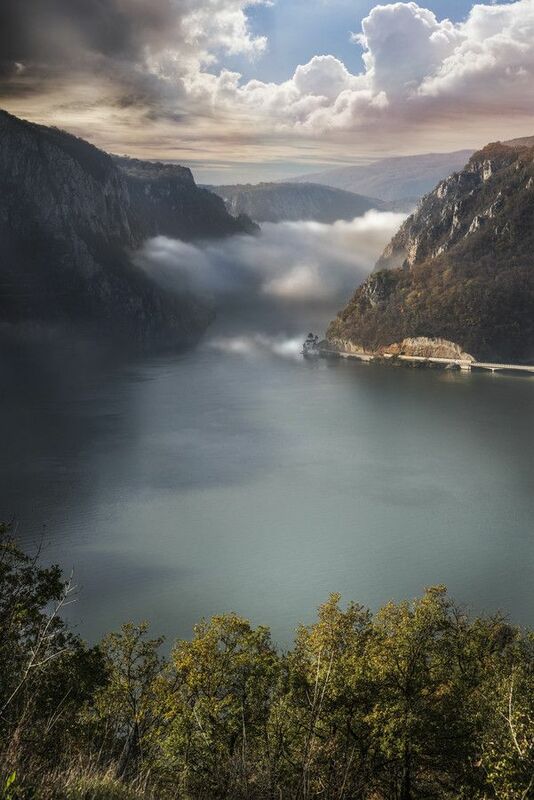 Now there most likely is a Danube the river wiht over in Europe. In which case, I would consider that to be different, a local land god that represents the major god for me. Something like the Wakčéxi or Rusalka. Prompt 2 of the non-binary mysteries roundtable involves Solar and Lunar Symbolism. Which is an incredible coincidence because I was just thinking about my own (probably strange) understanding of the Sun and Moon the other day, and how to write about it in the series of god posts that I’m creating to elaborate on my pantheon (you can find the first one here, that style is what I’m planning to write about each god/wiht with). Some of the original prompts are not shown here due to not applying in my particular case. Who are the sun/moon deities that make most sense to you? Are they even from your tradition? The concepts that make the most sense to me is the Female Sun/Male Moon concept, along with no gender associations at all. However, that’s for the actual celestial objects, the literal Sun and Moon. The sun’s part in photosynthesis and being essentially a source of life energy, along with being the center of the solar system and source of Earth (well, kinda, it’s a lot more complicated in actual astronomical theory but hopefully you get what I mean), gives the Sun more of a motherly feel in my mind. I sometimes consider her more specifically like a Grandmother, since she “gave birth” to the Earth and the Earth “gave birth” to everything else, including us. But, in general, the Sun feels female. Hence, I keep to the Germanic side of things and call her Sunna. The moon feels male. The reason for this will probably not make sense to some, or even be offensive, but it is what it is for my particular situation. My family is mostly female, and has always been centered around the women, particularly the mothers. The women run the house, keep things in order, and are the primary authority on things (i.e. “go ask your mother” was what the fathers usually said). The men are more external (all the women are biological relatives, while only a few of the men are) and more transient. Likewise, the moon is also more external and aloof, drifting in and out of different phases and exerting an indirect effect on existing life rather than directly producing it (I’m aware that this isn’t the most scientific of generalizations, but I’m not intending it to be such in the first place). Therefore the moon is Mano. While Sunna and Mano are Germanic gods and therefore are a part of my tradition, my imagination was heavily influenced by a friend’s stories of their gods, namely the solar goddess Karijiana and the lunar god D’miezak’r. They’re both an excellent writer and artist, so for several years I would read and see beautiful stories and depictions of those two and it’s stuck in my mind to this day, even if some of the stories and attributes aren’t relatable to my tradition. But their stories were my first introduction to the concept of a female Sun and male Moon in a time when all I ever heard were people worshiping a female Moon and male Sun. 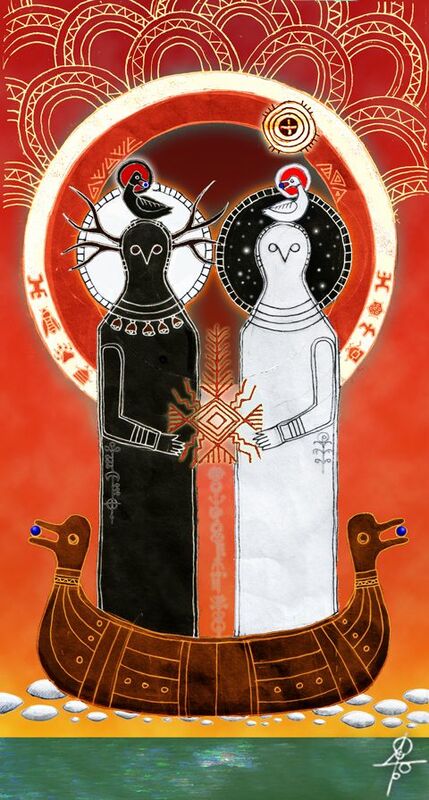 Reading about Karijiana and D’miezak’r made something click for me and from then on I became more comfortable with the idea of understanding the Sun and Moon as deities. Now to make matters a bit more confusing. I also have a male Solar deity and a female Lunar deity in my pantheon that are associated with the sun and moon, but it’s not certain if they’re literally the sun and moon. Napkirály and Hold Anya are (as far as I can tell) the Magyar versions of sun and moon deities. Yet, when trying to research how they were historically understood, I could only find snippets that were mostly focused on Napkirály and none of those snippets depicted him as being the literal sun. Hold Anya was worse, as I only had her name. Presumably she was not the literal moon as well, because other snippets suggested that the Sun and Moon were regarded as gender-neutral balls floating high in the sky in old Hungarian sources. I’m hoping to find more, but for now most of my understanding of the two deities are UPG. Basically, Napkirály and Hold Anya are cultural associations to what the sun and moon are observed doing, where Napkirály will fly over the Earth, keeping an eye on everything that’s happening and Hold Anya being associated with the tides and menstrual cycles. To be quite honest though, cultural stories aside, for the most part these deity names are just names and the Sun and Moon are essentially celestial bodies/forces of nature to me, rather than humanistic gods with personalities and stories. They are impersonal beings that create cycles by which humans make calendars and the natural world changes. They influence all of life as we know it, and will be here practically forever (relative to human lifespans). What bugs you most about the way solar/lunar symbology is constructed or described? I really do not like patriarchal male sun gods and the associations with order and authority. Just rankles me for some reason (but then again that’s probably due to my irrational dislike for Greek and Roman mythology that was brought upon by my schools and by Neopaganism). I can’t think of strong issues with any lunar symbology, though I do find the Maiden/Mother/Crone association with Waxing/Full/Waning to be a little tiresome and completely useless for me, due to the whole uterus=woman implications there. At least the earth being a mother makes sense since there’s literal growth and birth going on, but the moon? Nah. Being associated with menstruation is one thing, but having all stages of female life being centered solely on the uterus is another thing entirely. Bringing the moon into it just doesn’t make sense to me. Do you have sun/moon UPG that integrates your identity? Kind of, but not intentionally. Like I mentioned before, I usually hold the literal Sun and Moon as being female and male, respectively. However, while the Sun feels very firmly female and I’m highly uncomfortable with seeing her as male, the Moon I find feels both male and female, shifting back and forth like the phases. This was something that I felt before understanding my own gender identity, so it’s probably just a coincidence. However, I always had a fondness for the Moon and the common associations, such as silver and nighttime. So maybe it’s not a coincidence after all. 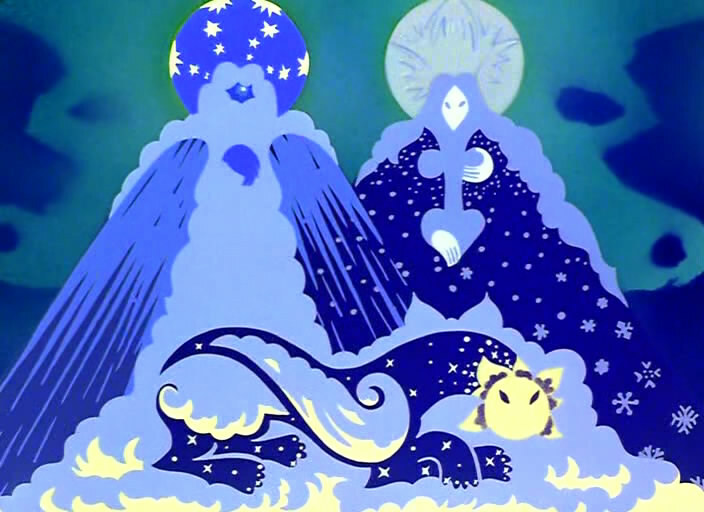 Screenshot of the divine parents of the Sun God from the movie Fehérlófia. They don’t match the description exactly but this movie has influenced much of my imagination and I can’t help but be reminded of this scene whenever I think of the Mother and Father. There is no earth yet anywhere, but in the immeasurable heights, Above in his golden house, sits the great heavenly father on his golden throne. 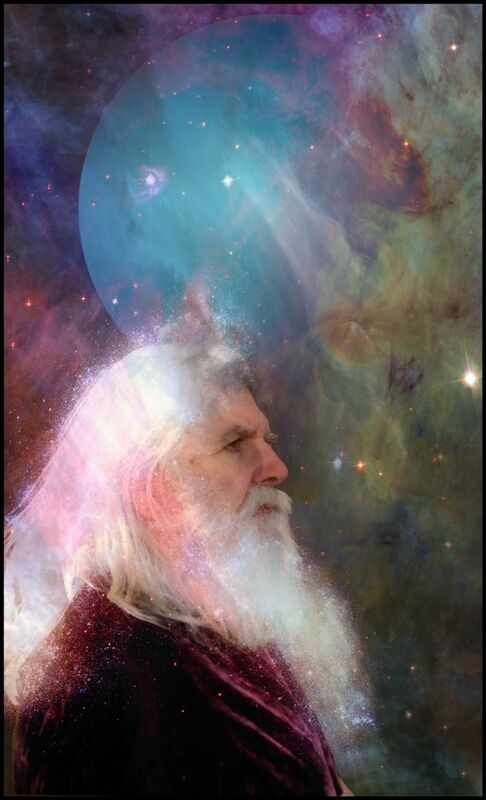 He is the old, white haired and white bearded God of eternity. 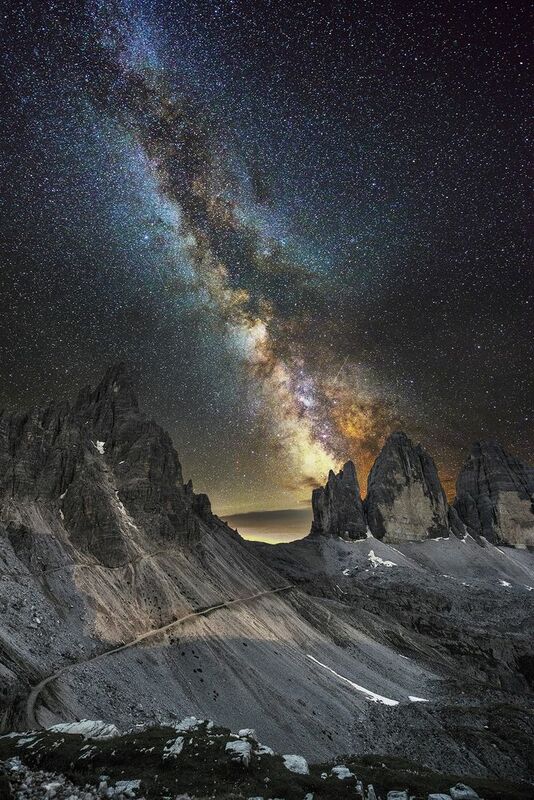 On his black robes there are thousands of sparkling stars. Besides him sits his wife, the Great Heavenly Mother. 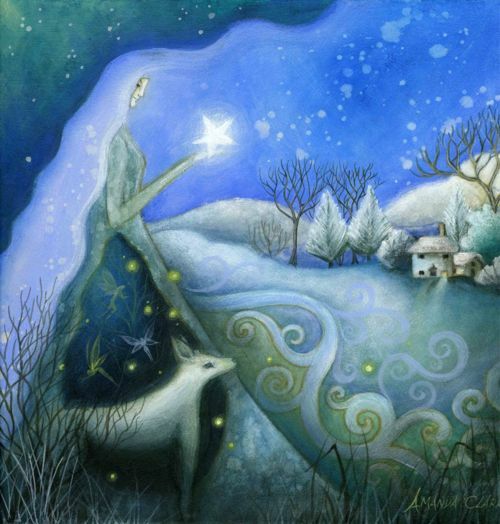 On her white robes (palast) there are thousands of sparkling stars. She is the ancient material of which everything is made. They have existed from eternity in the past and will exist for all eternity to come. These are the shapers of the universe, the origin of all that we see and know. I imagine them as the mountains rising in the distance, melding into the heavens, the aurora borealis, and the stars themselves. These two are a more abstract than the other deities because they act in a more pantheistic manner, particularly if you take the “ancient material of which everything is made” descriptor literally. If they make everything, then they are everywhere, and if they’re eternal, then they’re always everywhere. So there’s really no discreet deity to reference, other than the symbolic titles and descriptors that are mentioned in the passage. Therefore I consider these deities to be outside of our world, impersonal and not in contact with us in the way we are in contact with other beings. In a way though, one could consider contact with anyone and anything else to be contact with Them as well, but either way it’s an abstract extreme rather than something in the middle of the contact spectrum that defines most of our relationships. Humans often see the world from the inside-out, laying over their immediate family structure and immediate surroundings over the rest of the universe, presumably because it makes sense of things the best. Most ancient people, at least among the regular population, were family-based rather than individual-based, and one is defined by their family rather than just themselves. Following the strong historical importance of families and clans I am not surprised that the Source of all is understood as a Mother and Father duo, as those are the traditional starters for a family, that then develops into a clan. Everything that exists could be the “descendents”, therefore it’s all part of the same overall clan.